we want you to enjoy Serious Delights right from your own oven, and in your pajamas*. Remove from package and place in a greased pan and cover with plastic wrap. Let rise at room temperature (about 72 degrees) overnight, or 12 hours. Keep frosting refrigerated. In the morning… Remove plastic wrap, preheat oven to 350 degrees. Bake cinnamon rolls 20 to 30 minutes until golden brown. After baking, don’t forget the frosting! Remove from package and place on a sheet pan and cover with lightly greased plastic wrap. Let rise at room temperature (about 72 degrees) overnight, or 12 hours. In the morning… Remove plastic wrap, preheat oven to 400 degrees. Bake croissants 15 to 20 minutes until golden brown. Our pie shell bakes best on the lowest rack postion in your oven. Fill and bake as your pie recipie directs. If your pie calls for a pre-baked pie shell: line our pie shell with foil and weight the foil down with dry beans or pennies, baking for 20 to 30 minutes at 375 degrees. Our pizza dough is versatile and can be made into a deep dish pan pizza or a thin crust hearth baked pizza. It’s up to you and what equipment you have at home. For best results, make sure the dough is fully thawed and THEN let it rise at room temperature for at least two hours and no more than six hours. Shape as desired, top, then let rise another hour before baking at 475 degrees for 15 to 20 minutes. If you need dough right away, we always have fresh pugliese dough at the bakery, just ask a baker for assistance (before 3pm!). With hundreds of models of home ovens in various states of repair, it’s hard to give exact times and temperatures. We encourage you to try slight variations on the guidelines above to find what works best for your home! This is part of the fun of baking; even when the first twenty steps are the same, you can acheive very different results with the last few steps. In general, a higher baking temperature will give more rise and produce a darker but thinner crust. Higher baking temperatures are well suited for low sugar products (such as our croissants and biscuits). In general a lower baking temperature will give less rise and produce a thicker but lighter crust. Lower baking temperatures allow more time for the heat to reach the center of the product, and so prevent the “too dark but still raw” syndrome; if you are experiencing this it is a sure sign to try a lower baking temperature. We want you to have success with our take & bake products — hundreds of other customers have and you can too! 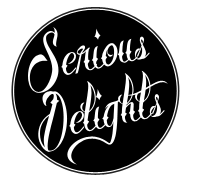 If you have a problem or question, please email us at info@seriousdelights.com.cpr5.ezhostingserver.com and we will be happy to help you. We won’t rest until your home is filled with the delicious aroma of fresh-baked Serious Delights goodness!